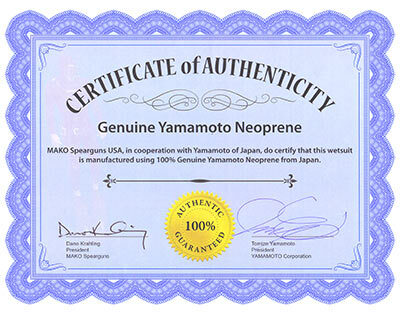 My wetsuits, socks and gloves are made of 100% genuine Yamamoto limestone based neoprene from Japan. But, because I sell direct, instead of through dive shops, my prices are actually lower than the cheap petroleum based wetsuits from China that are sold at dive shops. Only MAKO Spearguns offers LEFT/RIGHT SPECIFIC Freedive Socks made of 100% Genuine Yamamoto Natural Limestone Based Neoprene. They are truly the most comfortable and highest quality freedive socks in the world. 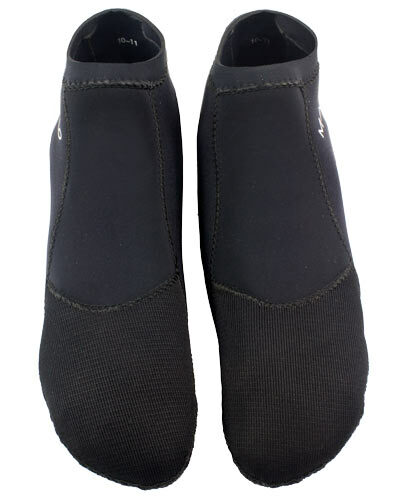 MAKO freedive wetsuits, socks and gloves are made of 100% genuine Yamamoto Neoprene. And because we sell direct to divers, instead of through dive shops, our world class 100% Yamamoto wetsuits actually cost less than lower quality suits made from cheap petroleum based Chinese neoprene that are sold at dive shops. If it doesn't say Yamamoto... It's not! Our Freedive Socks are certified by Tomizo Yamamoto (President of YAMAMOTO Corporation) and me (Dano Krahling, President of MAKO Spearguns) to be Genuine YAMAMOTO Neoprene. I lost one bootie in the Caribbean last summer, snagged a new pair for cold water bug diving. Quick shipping, great product. Thanks! Unfortunately this put a bit too much pressure on my feet to the point of them being uncomfortable, but that's an issue with my foot size/fin pocket size. I'll need to pick up some 1mm ones instead. Great fitting sock, although I experience the size to be a bit on the smaller side. If you're between sizes, chose the bigger one unless you like a really tight fit. Love these, going to order a pair of high cuts for my dive trip.